Coach Swarm pushed his streak to 8th straight years of winning at least one District throwing titles. Under his teaching, the Statesmen and Lady Statesmen won 11 Liberty District Titles from 2000 - 2003. 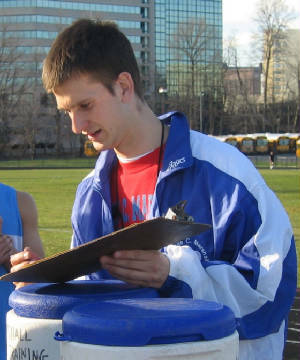 Athletes under his coaching captured 20 top three (3) finishes at Liberty District Championship, 12 top six (6) places at the Northern Virginia Regional and earned one All-State honor during the 2000 to 2003 period. 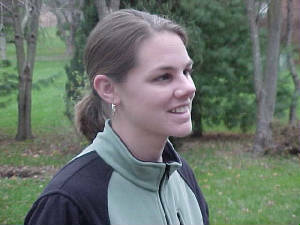 Carissa Culbeath: Two (2) Outdoors Shot Put (2001, 2002) and Discus titles (2001, 2002), One (1) Indoor Shot Put title (2002). Chris Barham: Two (2) Indoor Shot Put titles (2001, 2002), One (1) Outdoor Shot Put title (2001). A.J. 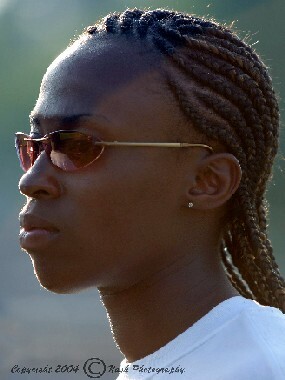 Wallace: One (1) Discus title (2002). Tim Silver: One (1) Indoor Shot Put title (2003), One (1) Outdoor Shot Put title, One (1) Discus title. 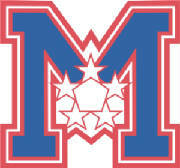 Coach Swarm is a graduate of Marshall High School who has help produced many regional and state representatives. He a government teacher at Marshall and coaches both girls and boys shot put and discus. 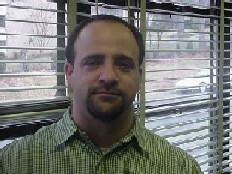 He is also the defensive line coach for the Marshall Football team. High School: Litchfield High School, Connecticut. **Junior Lance Cheng qualified for the Regional championship and medaled at District Championship. **Five (5) athlete dipped under 10 seconds in the 55m hurdles this season - Cheng (8.62), Junior Keith Henning (9.27), Senior Benjamin Yazman (9.36), Freshman Akkarin Chorachaturaphak (9.71). **Akkrin Chorachaturaphak was named Outstanding Freshman of the year, LJ (14ft 8.25in), TJ (30ft 4.25in), 55m (7.64), 300m (40.72), 500m (1:16.15), 3200m (12:20.24) 55mH (9.71). Sophomore Lance Cheng and junior Melissa Neo were voted Most Improved Athletes for the season. All athletes under his coaching achieved significant personal best in their event. Sophomore Lance Cheng automatically qualifiied for District in the 110m and 300m hurlders. Sophomore Isaac Beverly automatically qualified in the 300m hurdles. All athletes under his coaching achieved significant personal best in their event. Competed the Boston and Marine Corps Marathon in personal best. Had five athletes make the Liberty District semi-finals in the 55m hurdles and posted the fastest times in the last five seasons. Had two athletes make the Liberty District semi-finals in the 110m and 300m hurdlers and posted the fastest times in the last five seasons. * 2002 Old Dominion Conference CC Runner of the Year. *Member of 11 conference championships. *2000 CT State 3200m Runner Up. Assisted in coaching Sophomore Jason Pennington to Liberty District 6th place performance in the 1600m and a spot in the Northern Regional Championship. The 4x800m relay team ran the fastest time in 5 years. Assisted in coaching regional qualifiers sophomore Theo Robinson, freshman Jacqueline Hargrove and Devin Mawdsley. Coached Junior Kaitlyn Johnson to two medaling performances at Liberty District Championship in the Shot Put and Discus. Assisted in coaching Freshmen Jacqueline Hargrove to a bronze regional bronze medal and State Qualifier in the Long Jump. Assisted in coaching regional qualifiers sophomore Theo Robinson and freshmens Jacqueline Hargrove and Nicole Harrison.